When our father suffered a massive brain haemorrhage our lives changed forever. He was not expected to live. Life, priorities, love, friends, family, money, health – everything has gained a new, in many aspects finer and better perspective. A renaissance in our lives. Finding little or no survivors stories online, my sister and I decided to tell our story along with those of many others whose lives have crossed ours in this journey. Although our father could swallow food in small quantities, he was mainly fed through the ryles tube. 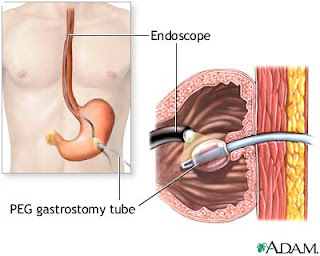 With repeated episodes of him yanking it out due to discomfort and given his chronic cold, we were advised to have a PEG tube inserted in his stomach. Apparently ryles tube is a temporary solution, not recommended for more than couple of months, if even that. So we decided to have the PEG in place. It's a fairly simple procedure, does not take more than 20 minutes. There was a gastroenterologist in our hospital, whom I will hence forth refer to as Dr. G. He seemed friendly and we zeroed on him to perform the procedure. Dr. G, recommended that we get our father admitted a day before the procedure, then stay for another couple of days to monitor him. Although the expenses for such a stay at this corporate hospital seemed daunting, we opted for it given it was for the greater good! Incidentally in July 2010 we were admitted at the hospital for Urinary Tract Infections (UTI). Since we were already at the hospital, requested Dr. G to take a look at our father for the PEG insertion. He asked for some tests, which we later learnt were redundant and pretty expensive. Since all doctors advised us to have the PEG once he was clear of the UTI, we went home with just the good old ryles tube. A month and half of no infection, we were recovering financially from the previous unexpected hospitalization, so decided to get the PEG inserted. But there, UTI again. Been there, done that, so we knew the drill, had the antibiotics from home. All about our UTI days in the previous blog posts. By October my sister was at her impatience best. She wanted the PEG placed if possible in the next hour. We talked about it all the time as if it was salvation itself. Dr. G asked us to bring our father for a check up. He seemed unusually curt during the visit. We were wondering what ever happened to his genial nature. Dr. G said our father was too critical and he wanted an Anesthesiologist to clear our father for the surgery. He made our father sound like the most chronically sick and terribly unstable patient to get a PEG ever. The thought of taking our father to another visit to the Anesthesiologist in the wheel chair and the logistics of it seemed exhausting. But when Dr. G called up the Anesthesiologist, he was told the visit was unnecessary and it was sufficient for him to see our father just before the procedure. Phew, relief. Since Dr. G was travelling for a couple of days, we schedule the procedure tentatively for sometime in the middle of the week following our visit. We got the required tests done, all good, all set for the PEG. My sister was literally counting the days. Dr. G gets back, I call him and he says with the procedure set for the next day, and that it was too soon to tell exactly at what time he would perform. Didn’t understand why exactly it was too soon? So call him the next day, the day of the scheduled procedure, Dr. G tells me he as some sort of flu, so, sorry it cannot be done. He neither sounded apologetic nor nice about it, but it was more like a snarl. That was it. My sister had it. She called up Dr. G and demanded what did he mean by he had flu. I thought it was pretty clear what he meant. She asked him to somehow perform the procedure. I couldn’t understand how he would do it, with being sick and all, neither did he. She then suggested he recommend another doctor who would do it, and do it immediately. Dr. G recommended a name, say Dr. R, I spoke to him and we were on our way to the hospital in an hour. Dr. R asked not too many questions about our father, barely looked at him, sedated him in, inserted the PEG and he was wheeled out. I ask him if hospitalization was required for observation, he looks as if I asked him if we could move into his house. He slowly nodded his head to indicate it was unnecessary. My sister made discreet enquires if Dr. G usually came in for PEG procedures. We were told by the staff that he had never performed a PEG insertion. Not wholly surprising given how fidgety he was, prescribing unwanted tests and acting like a nervous wreck. Such simple procedure and so much drama. Somewhere in 2011 my good friend Rohan sent me a link to a documentary on Ayurveda. It showcases different practitioners of Ayurveda, its ninth part caught my attention. One, a patient in the film suffered from brain hemorrhage and two, the doctor (he is an indigenous healer / vaidhiyar, not a certified doctor) lived in Southern India which would make the travel not too adventurous. I guessed the adventure part incorrectly. Sri Narasipura Subbaiah Narayana Murthy (the Doctor) lives ofcourse in Narasipura, which falls under the Shimoga district in Karnataka. My research prior the travel showed that all one needs to do is to get to Narasipura or Shimoga and locals know the doctor's place. Few years ago at ourAcutouchtreatment we made the acquaintance of a wonderful mother-son duo. Rudra, the boy was all cuteness and Kavita, his mother was friendly and resourceful. Places like these are great treasure troves for information on different treatments and doctors. Kavita highly recommended Dr. Manik Hiranandani who runs an alternative treatment clinic, which is called just that - "The Clinic", at Malakkara in Kerala. He uses a combination of treatments, but the main focus seems to beCranio-Sacraltherapy. After our misadventure with the Varma treatment during our Kerala stay, Dr. Hiranandani seemed worth pursuing. Given his hectic schedule and our inability to take our father to his clinic just for a consult, we scheduled a meeting at a rather unconventional place - the meeting was outside a bakery on the highway that was taking the Doctor from Ernakulam airport to Malakkara. Visiting Bangalore this weekend made me stop at the office of the Spandana Public Trust. This is the organization that has provided us with two amazing live-in nurses since we got our father home. Having spoken to them only over phone, thought best to put faces to the empathetic voices answering our calls. Ms. Sunanda and Ms. Rathna, who always field the calls, were at the office on the crisp and sunny morning when I walked in to Spandana. The office is a flat in an apartment building located at a quiet and affluent neighborhood of Koramangala. There were some nurses waiting in the outer office looking for work. Walls in the waiting area were filled with motivational posters. Got couple of ideas on what it takes to be successful. There were Spandana trained nurses sitting in another room waiting to be placed. In a smaller room past all these room, both the ladies sat with a mobile and a landline each that rang incessantly.